Wire Framing is a productive tool that can be used to create visually compelling and realistic models of commercially available phones, tablets, screens and web pages. 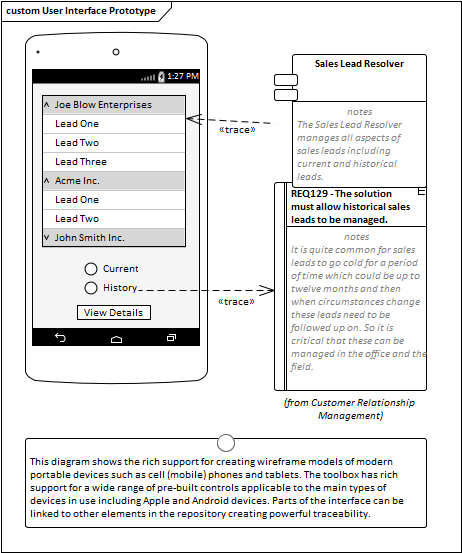 The diagrams assist Business Analysts, Experience Designers and others communicate with stakeholders, allowing them to demonstrate the solution interfaces. Many stakeholders will understand how a solution is going to work if they can see something concrete and visual. The Wire Framing tool is perfect for this situation where a mock-up of the user interface of a phone, tablet or web page is created including page layout, interface and navigational controls representing different parts of a User Story or Use Case. A Business Analyst or Experience Designer will typically create Wire Frame models for the devices that are being targeted in the solution. The interface elements and navigational controls can be connected to other elements in the Repository. For example a drop down list could be connected to a data source indicating the origin of the data. A slide show could also be created to walk a stakeholder through a sequence of diagrams representing the flow through a User Story or Use Case. The toolboxes contain elements for the devices, pages and screens and a wide range of controls, widgets and other elements. Tagged Values can be set to hide or display elements of the interface such as phone menu buttons and notification bars.